Scrolls of Legendry is for the overlooked and forgotten, whether they’re lost classics or things that would be better off undiscovered. We’re only going to review old, out of print books, with a few exceptions for reprints or other works of interest to us. Some of these titles probably haven’t been reviewed in decades… or in some cases, at all. 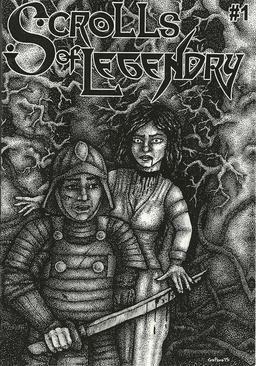 As you may have inferred from the title, the main focus in the pages of Scrolls of Legendry is fantasy (especially of the sword & sorcery variety), because that’s what we’re most passionate about. But we’ll also include related genres such as horror, historical adventures, and science fiction. 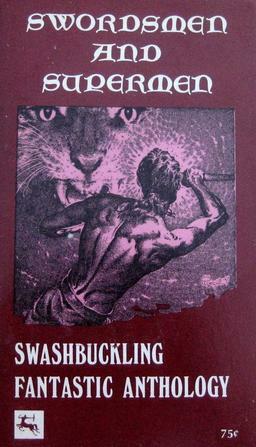 If you’re a fan of the great authors of Weird Tales like Robert E. Howard, H.P. Lovecraft, and Clark Ashton Smith, Scrolls is for you. In addition to reviews, each issue we’ll have a story or article. For our debut, Jeff Black presents us with “The Heaviest Sword.” It takes place in Japan, an underused setting for sword and sorcery. The first issue proved to be surprisingly packed for such a slender little zine, crammed with articles on long out-of print texts by H. Bedford-Jones, John Christopher, Tanith Lee, Robert Lory, F. Van Wyck Mason, Thomas Burnett Swann, Karl Edward Wagner, and others. The second half of of the magazine is given over to Jeff Black’s short story “The Heaviest Sword,” a moody, blood-drenched tale of a massacre of a village by a company of samurai looking for rebels… and a vengeful specter that soon interrupts the proceedings. Black knows how to keep the action moving, and his descriptions are powerful. But the action jumps around too much — changing scenes as much as six times in seven paragraphs — which keeps the story from ever becoming truly coherent, or building real momentum. There’s no explanation for where the specters came from, or why they’re there, so the otherwise horrific ending doesn’t have much genuine impact, either. Overall, I really enjoyed Scrolls of Legendry. I’m definitely in the target market, but I think the magazine has a lot to offer anyone who’s curious about classic weird fantasy of all kinds. Scrolls of Legendry #1 was edited by D.M. Ritzlin, with reviews by D.M. Ritzlin and Jeff Black. It is 16 pages (including covers), priced at $3. It was published by DMR Books, and is limited to 100 copies. Copies are available through DMR Books, and Storenvy. Our October Fantasy Magazine Rack is here, and all of our recent magazine coverage is here. This looks awesome! I’m also excited that it’s a print zine. That cover is great. Thanks for clueing us in, John. Ha! I read that anthology last year. Don’t recall being super impressed by it, although the Howden Smith story was probably the highlight. And I’m glad to learn it was edited by Donald M. Grant — I’d never been able to find the editor previously. And yes, I did just order a copy of the zine. 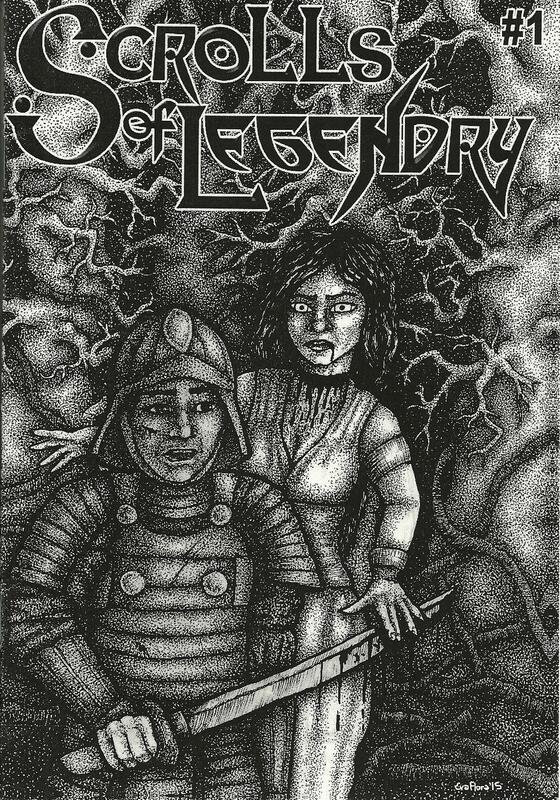 Just read issue #1 of Scrolls of Legendry and have to say that I’m a fan. Really enjoyed the mix of reviews and story. I disagree with John about Black’s short story. I never found it incoherent. I thought the mix of flashback and ongoing narrative worked to build tension for the climax. Bought Swords of Steel when I bought the zine. Looking forward to reading it. Look forward to a #2 of Scrolls of Legendry too. Glad to hear it, NOLAbert. I’m looking forward to the next issue as well — and seeing what new fiction Dave finds for us.